What if Romeo and Juliet hadn’t topped themselves? What if they had a long and happy life together? Ben Power’s new play re-invents the tale of the star-cross’d lovers, using Shakespeare’s words. We meet the couple at the end of a long and happy marriage but tragedy stalks them. Juliet has a debilitating and terminal illness. Parting is not only a sweet sorrow but a creeping inevitability. At first, the play seems a bit of a gimmick. With the script re-mixed, I was distracted by trying to place the lines from the original: which scene is that speech from? Who speaks those lines in the original? But, as the relationship between the two characters is revealed, I became able to sit back and take the play at face value. Richard McCabe’s Romeo is a lovable old duffer. His raincoat makes him a bit like Graham Lister from Vic & Bob’s Fantasy Island. Beneath that, he sports a brown woollen suit, which, along with his hair and specs, adds to his nutty professor appearance. He shows people on the front row a photograph in his wallet and takes us back to a time before Juliet became bedridden with illness to a time when they would go dancing. 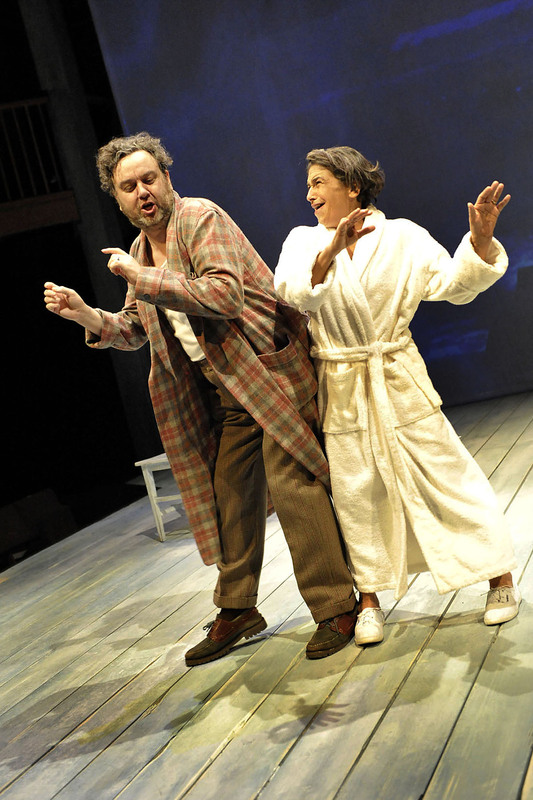 Kathryn Hunter’s Juliet is a bright-eyed little thing, retaining a girlish sense of fun in her later years. Hunter uses her remarkable physicality as a performer to portray Juliet’s decline. Their dancing becomes the daily routine of the carer and the cared-for; the actions speak at least as loudly as the famous words. Lines like “I have forgot why I did call thee back” take on a new significance as Juliet begins to wane. She reveals, using a speech of the Nurse’s, that they had and lost a child. This speech is later repeated as Juliet succumbs to dementia and delirium. Hunter’s performance is powerful and striking, matched by McCabe’s patient and doting husband, his frustration and his anger. They agree that when she is too far gone, he will assist her suicide. Here the herbs and the potion of the original come into (the) play. The morality of their decision and the action taken is not an issue. This is shown to be a private matter, an arrangement between two loved ones, without the brouhaha you would get in an issue-based drama. Director Helena Kaut-Howson dilutes the encroaching misery with moments of beauty, using music by John Woolf and movement direction by Jane Gibson: withered Juliet springs, in her imagination, from her wheelchair and dances around, full of vigour and life – in her mind at least. Curiously, the play is depressing and uplifting, often in the same moment. It is grim and heart-warming. It shows there is a kind of plasticity to Shakespeare; you can bend him in order to shed new light on the human condition. The vaguely seashore setting, with only a chair or two and a free-standing door, indicate this is happening nowhere in particular but anywhere and everywhere. This is not a tragedy about a particular couple in a particular set of circumstances. This is the more general tragedy of our mortality. We reach old age if we’re lucky. If we have someone with whom to share our declining years, we are luckier still. But the inevitability of death, that irresistible force of nature – here symbolised by video footage of the sea – is coming for us all. This entry was posted on Friday, October 5th, 2012 at 10:29 am	and tagged with A Tender Thing, Ben Power, Helena Kaut-Howson, Jane Gibson, John Woolf, Kathryn Hunter, review, Richard McCabe, RSC, Stratford upon Avon, Swan Theatre and posted in Theatre Review. You can follow any responses to this entry through the RSS 2.0 feed.